Spratly Island is the largest of Vietnam’s outposts and the administrative center of its presence in the area. In 2015-16, Vietnam undertook an expansion of the island to extend its small runway and create a protected harbor. In total, Hanoi created about 40 acres of new land at Spratly Island through a process that involved the use of construction equipment to dredge up part of the reef surrounding the island and cover it in sand. 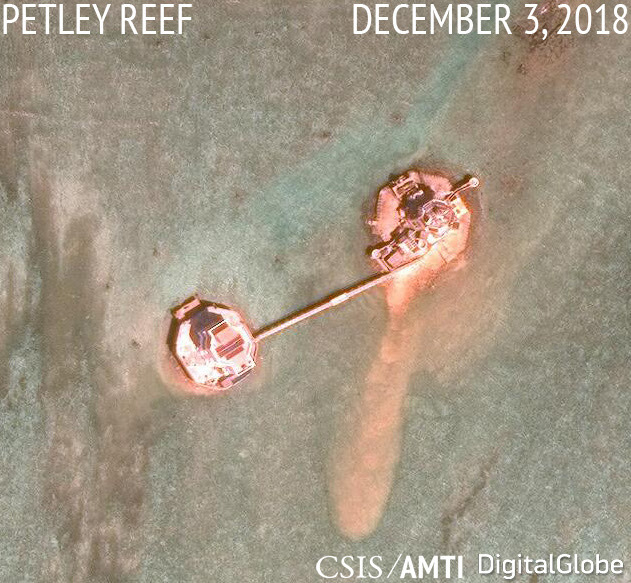 This process was more time-consuming and less environmentally disastrous than the methods used for China’s industrial-scale dredging and landfill at its facilities in the Spratlys, but still involved the intentional destruction of coral reef. Since AMTI last published a survey of all of Vietnam’s facilities in mid-2017, Hanoi has continued modest upgrades to the island. All buildings constructed in the last two years are highlighted below. The island’s expansion allowed Vietnam to extend its runway—the only one it possesses in the Spratly Islands—to 1,300 meters from just 750. Since 2017, Hanoi has put the finishing touches on the ends of the airstrip. In the middle of that year, it completed two large sets of hangars at either end of the runway. 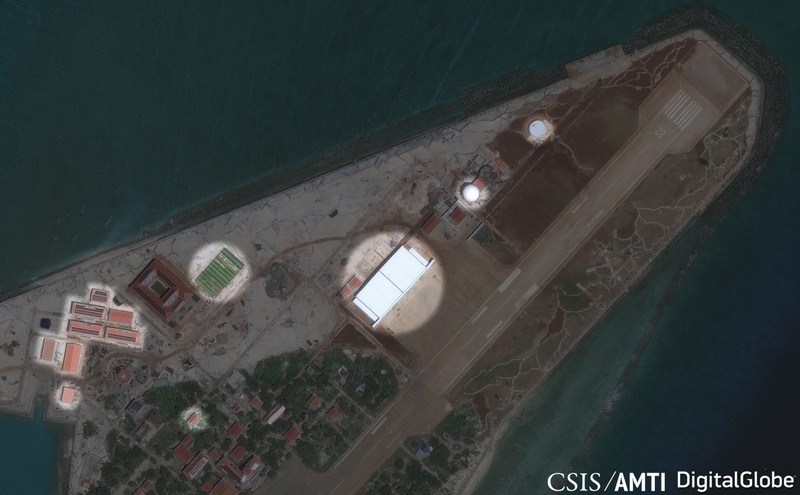 These four hangars are most likely intended to host Vietnam’s PZL M28B maritime surveillance aircraft and CASA C-295 transport planes or similar assets acquired in future. 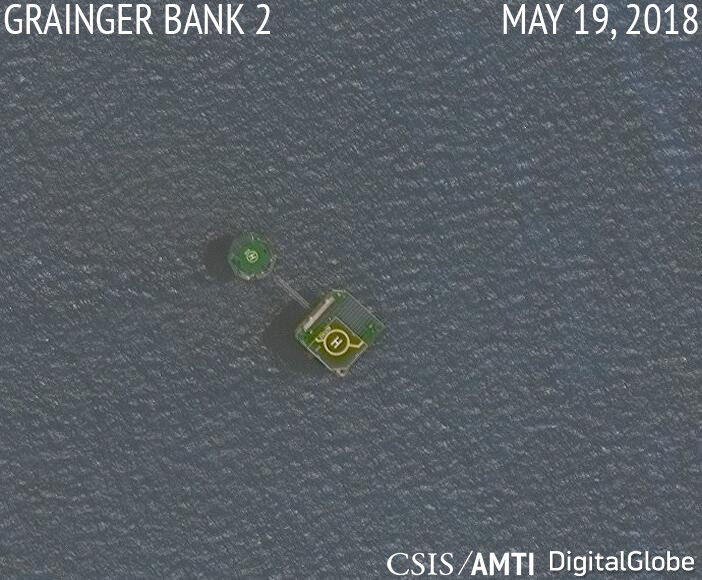 On the northeastern end of the island, Hanoi has constructed a pair of large signals intelligence or communications facilities, one of which was topped by a radome in 2018. A cluster of buildings were constructed on the area of new landfill alongside the island’s artificial harbor. Many of those have been topped by solar panels, and a new sports field has been constructed alongside the island’s main administrative building, which has also received new solar panels. 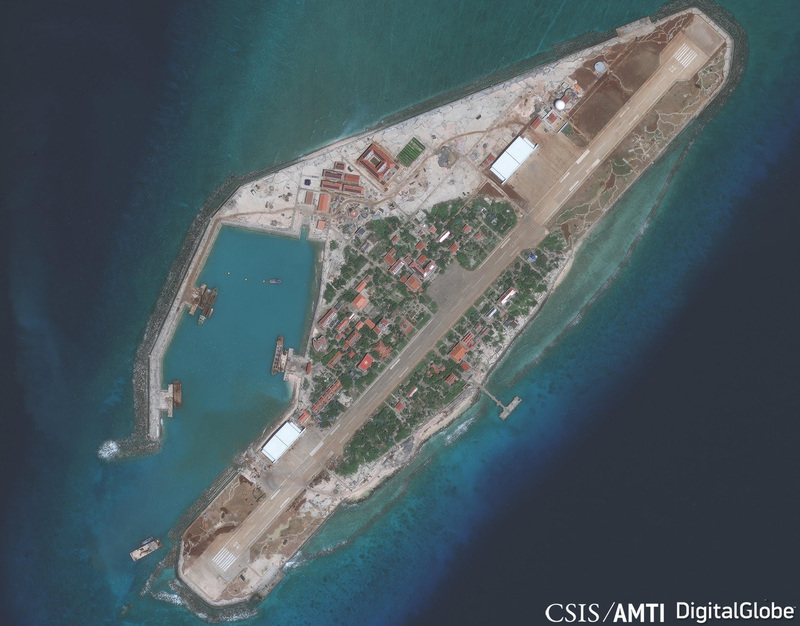 To protect all of this newly-formed land from storm surges, Vietnam has dug an intricate series of drainage channels along the edges of the island—a feature visible on several of its other enlarged holdings in the Spratlys. 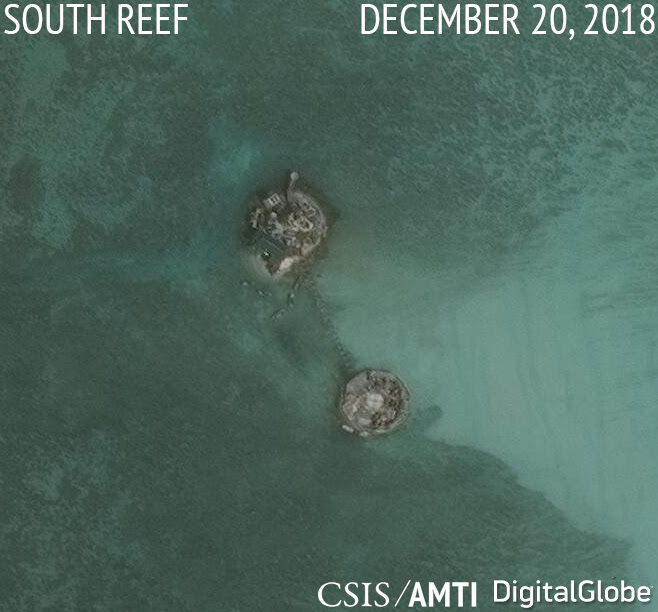 In addition to Spratly Island, Vietnam has made some modest improvements at the small cay it occupies on Pearson Reef (it also has a pillbox-type facility built on another section of the reef). Hanoi added about 6 acres of new land to the islet on Pearson prior to 2014 and undertook facilities upgrades from 2016, including the construction of a helipad, solar panels, and planting of vegetation across areas of new landfill. 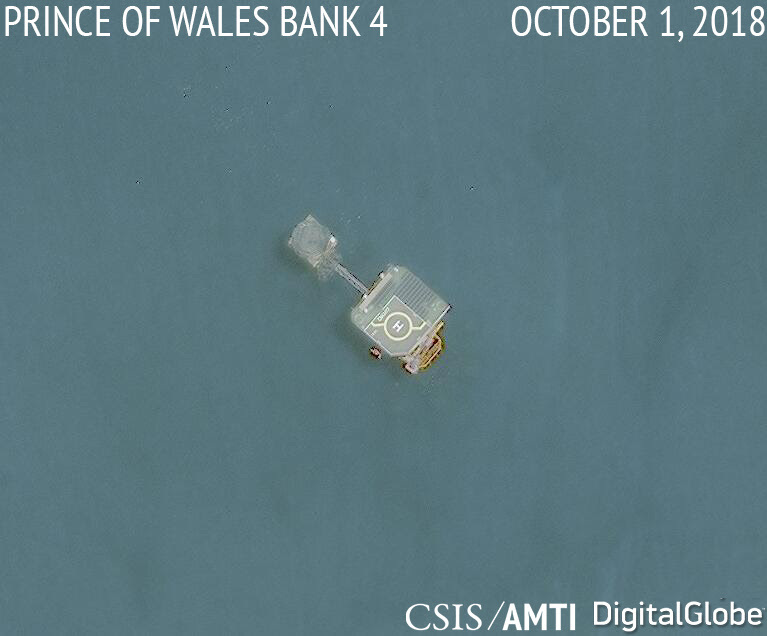 Since mid-2017, a large radome has been installed atop a building on the western side of the islet, suggesting an improvement to signals intelligence or communications capabilities. The planting of greenery across the areas of artificial landfill, presumably to ward off erosion, also appears complete. 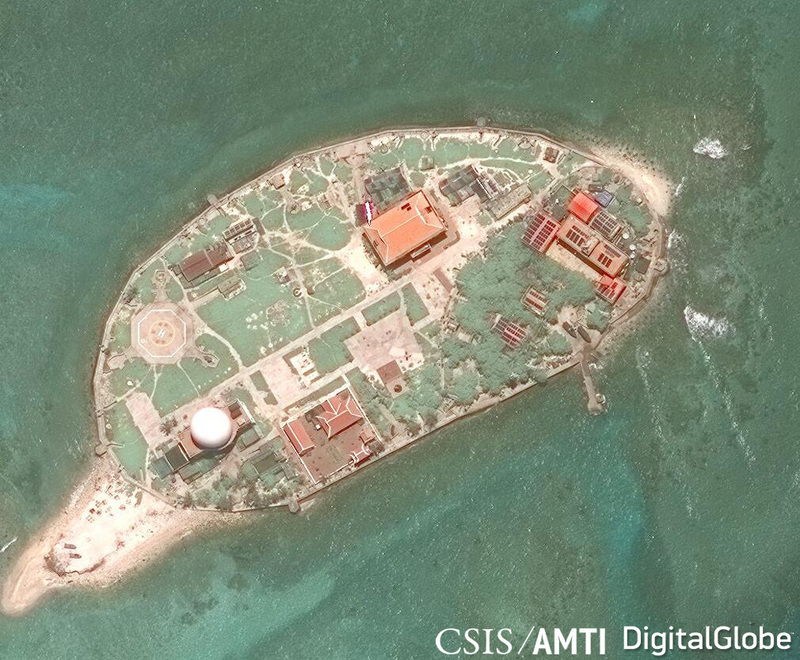 Most of Vietnam’s holdings are not on natural islets like Spratly and Pearson, but rather small facilities perched on low-tide elevations and entirely submerged reefs or banks. 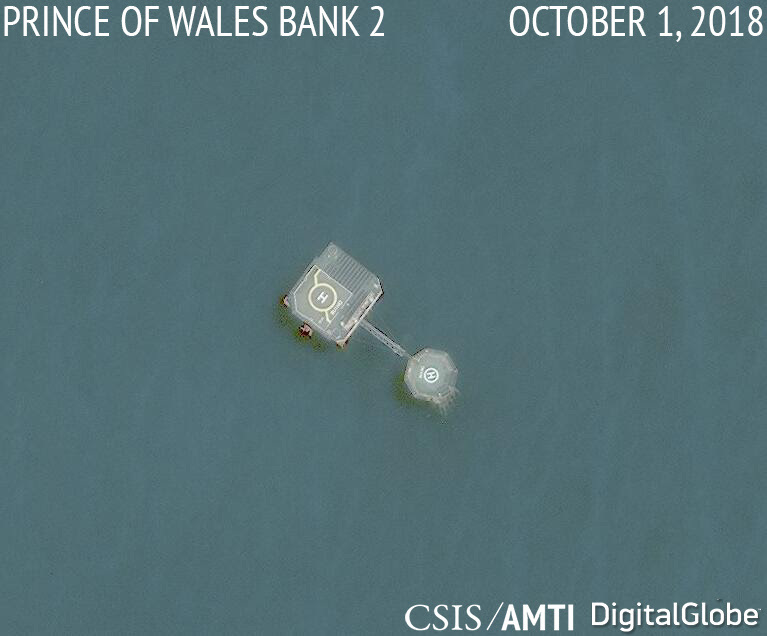 The most numerous of these are the 25 pillbox-like structures constructed on reefs around the Spratlys. Since mid-2017, two of these—on Petley and South Reefs—have been expanded with the addition of a second structure. The facility at Petley was complete by late 2018 while construction was still ongoing at South Reef in the most recent imagery available. To the southwest of the reefs and islets of the Spratlys are six underwater banks that Vietnam considers part of its continental shelf but which China and Taiwan claim as part of the Nansha islands (which include but are not limited to the Spratlys). Vietnam has constructed 14 outposts in this area, which it calls “economic, scientific, and technological service stations,” or Dịch vụ-Khoa (DK1). 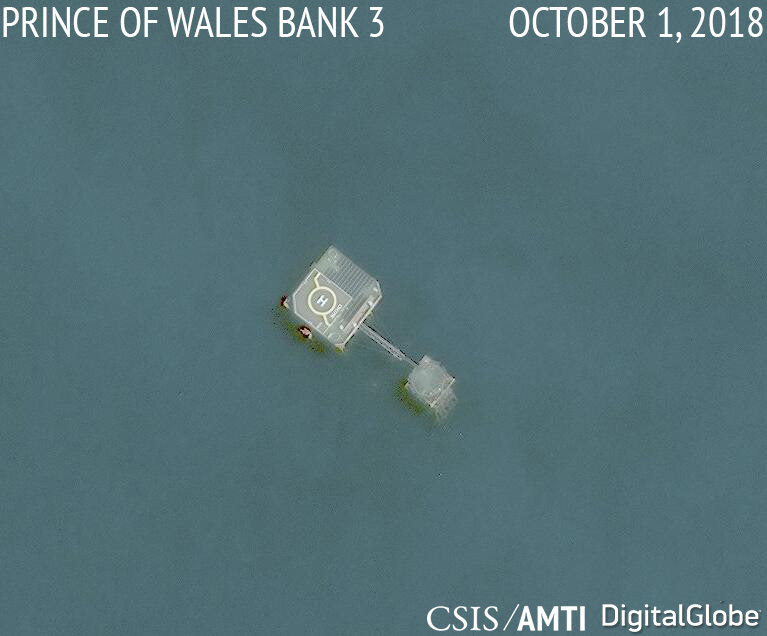 These submerged banks are surrounded by oil and gas blocks which Vietnam has licensed for exploration by foreign energy companies over the objections of China. Hanoi has been forced to suspend two of these contracts since 2017, reportedly after threats of violence by China. Since mid-2017, four of the DK1 platforms on Prince of Wales and Grainger Banks have been expanded with the installation of a second multi-story structure and larger helipad. They join eight others expanded between 2016 and 2017. 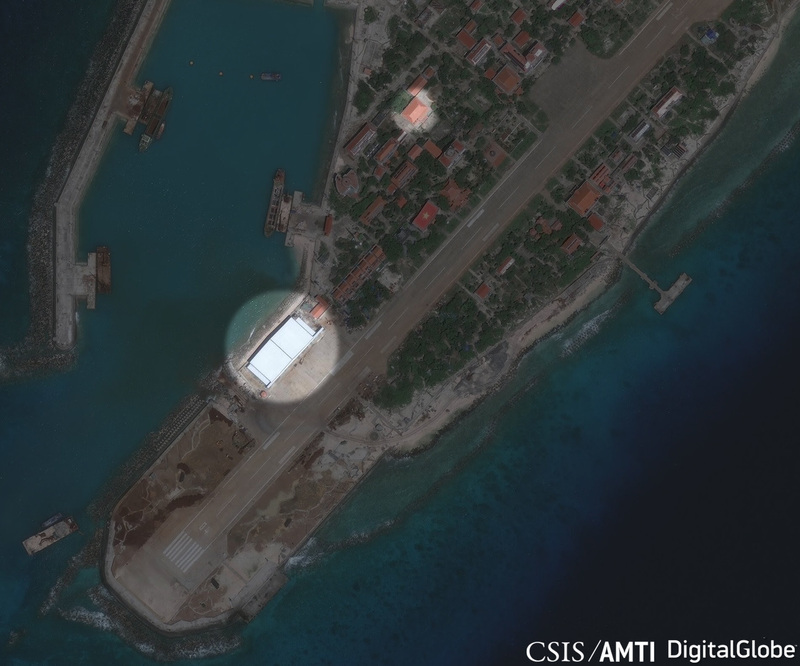 It seems that regardless of external factors, whether amid negotiations and relative calm or tensions and threats of violence, Hanoi is committed to a steady but modest expansion of its capabilities in and around the Spratly Islands. Vietnam has not attempted to engage in the same large-scale militarization of its features as China; there is no sign of facilities built to house attack aircraft, for instance. Instead, Hanoi’s upgrades seem geared toward expanding its ability to monitor and patrol contested waters and, especially in the case of its pillbox and DK1 platforms, improve living conditions and ensure it can resupply by air if necessary. 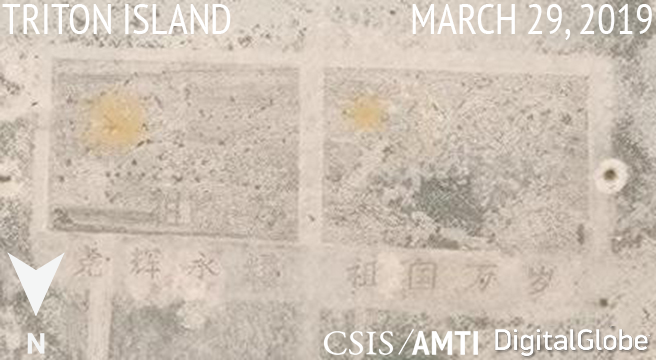 In February, AMTI pointed out that Manila had painted a Philippine flag on the roof of one of its facilities on Loaita Cay, competing with similar patriotic art displays by Vietnam on a Spratly Island rooftop and China on the beach at Triton Island in the Paracels. Not to be outdone, China has expanded the display at Triton in recent months. It covered up the original exhibit with a new one showing both the flag of the People’s Republic of China and of the Communist Party of China. Writing beneath the former still says 祖国万岁 (Long live the motherland), while under the latter has been added 党辉永耀 (The glory of the party shines eternally). 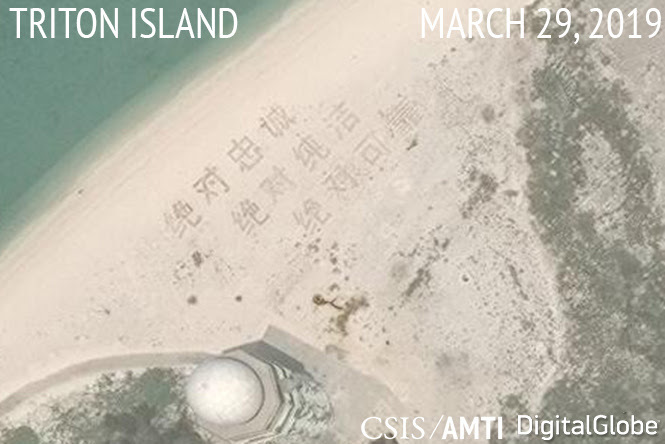 And on the island’s northwest beach, soldiers have written a message that translates to “absolutely loyal, absolutely pure, absolutely reliable,” a term first used by President Xi Jinping in 2012 to describe the People’s Liberation Army’s role.